The Fourth of July! It’s my favorite holiday of all holidays. What’s not to love? It’s summer, the pools are open, parades are everywhere, the freezer is stocked with popcicles, BBQ’s are front, left, and center, everyone is making festive American-as-apple-pie desserts, and the night ends in fireworks. A girl could live in July forever. 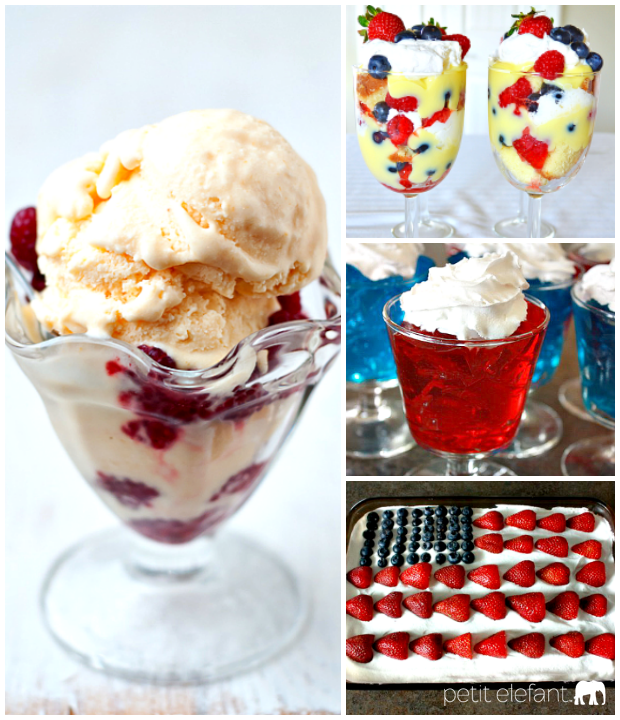 To celebrate, I’m sharing four of my favorite, very American, Fourth of July desserts with you. The American Flag cake has been my go-to 4th of July BBQ contribution for almost 20 years. It’s so easy to make and looks so festive. Every host/ess loves having at least one of these on the buffet. The base can be made as a cake or as a Jell-O, (it doesn’t get more American than that), and are equally delicious. The ice cream takes a little bit of pre-game prep but is worth every bite. I tend to be a little more greedy with my homemade ice cream, because it takes so long to make, but you’ll be the toast of every party if you show up with this homemade peach ice cream. The red + white Jell-O desserts are so much fun to share at a BBQ! They look so great, layered blue / red / blue / red, and the kids go bananas for them. They’re super easy BBQ food too, they’re perfect served in clear plastic cups and can be eaten with a spoon standing up. The fruit berry trifle is out of this world easy, pretty, and so delicious. Remember the trifle Rachael made for Christmas on Friends? This is what that dessert should’ve been, minus the peas and what was it Ross said it tasted like, “feet“? This trifle is the opposite of that. It’s smooth pudding with tasty fruit, cake + cream filling. Delicious. I hope you make at least one of these desserts, and have so much fun on your Fourth of July!